Thank you Dominoes! Now I can have pizza without feeling so guilty. Of course, I have to admit, I've not been so careful about what I've been eating lately. I confessed that a while back. When I don't have time to drive to Perry (the nearest Publix), it's really hard to stock up on what I need to stay gluten-free/ wheat-free. I'm still doing well avoiding the dairy, but it's so hard to avoid wheat! As I've said before, I'm so thankful that I'm only sensitive to it. I can't imagine how hard it is for those who have no choice but to avoid it. Anyway, this picture was from a few weeks ago. 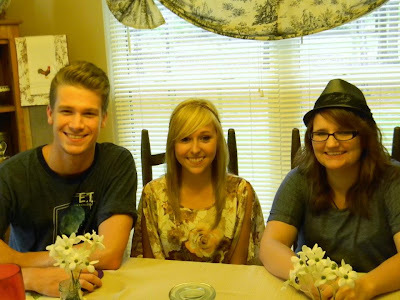 The week Dillan left for college, I invited two of his closest friends over for a pizza supper one night. So I decided to try the gluten free pizza from Dominoes for myself. It was actually pretty good! I didn't really feel like I was eating a 'special' pizza. I told y'all early on when I started this 'journey to better health' all of the reasons I had decided to get in better shape. My journey started back in March, so it's been 6 months so far. I'm still proud of my progress..lost 9 lbs and body fat through my mid-section. I shared with you a few weeks ago that I had gained a couple of pounds back. I think the biggest reason for that is the fact that I slowed down in my exercising. I really thought as my hormone levels got better, the weight would come off on it's own and I didn't want to lose too much by exercising like a maniac like I had been. Well, as of last Wednesday, my exercising has had to come to a complete halt for a few weeks. I had to have an unexpected surgery and was told 'NO EXERCISING' for 3 weeks!